derika (5 years ago) Inappropriate? morganahope (6 years ago) Inappropriate? fantastic !! tank you so much !! thanks you for your generosity! mavea (8 years ago) Inappropriate? Thank you! I like all your backgrounds! Balberty (8 years ago) Inappropriate? GOD Bless you... 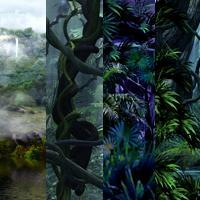 I needed a really cool jungle background for my website, and this is perfect!! Elusive Dreams (8 years ago) Inappropriate? RafaTG (8 years ago) Inappropriate? Man, you're very good! I just wish I have them as a bryce scene so I can work over them. luci45 (8 years ago) Inappropriate? DarwinsMishap (10 years ago) Inappropriate? souloflayla (10 years ago) Inappropriate? Thank you for the backgrounds. It is always the really gifted artists who give their freebies away no-strings-attached. I have yours in a folder with your name on it, so you will get credit, at least, if they are used in any way. Fantastic stuff! Are You kiddin Me ??? This is an Awesome Background Creation to say the least, 4Sure !!! Very much appreciated Tony really, thank you for sharing your craft with the Community ! Beautiful/Outta Site !! !